"Today Is a New Day for Me"
It was amazing to see on our Facebook page the testimonies of so many women who veiled at Mass on December 8 for the Solemnity of the Immaculate Conception! Today is a new day for me. This is something that has been in my heart for a long time now, actually ever since my spiritual conversion almost 19 yrs. ago. 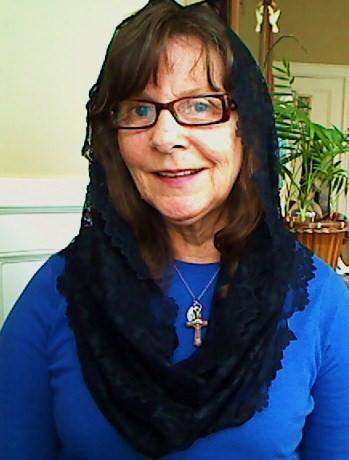 Thanks to your post that I saw in my news feed a couple of weeks ago promoting a campaign calling for women to start veiling on Dec. 8th, the Solemnity of the Immaculate Conception, I new that it was time and ordered a veil for the occasion. It was a profound experience for me today, and I am so happy that I found this video to help give an idea of what I also felt. I immediately felt the difference. I felt an even stronger sense of God's presence, and a greater focus on the Mass. It was a beautiful, wonderful experience that should have happened years ago! I had always veiled as a child, as it was required then, and had also loved how when I visited my in-laws in Mexico my cuñadas, and many other women always pulled their rebozos that they wore around their shoulders up to cover their heads on entering the church. It was such a great witness that we were now entering a holy place, and were no longer a part of the "outside" world. So now, today, starts a new journey for me in more ways than one. Not only is today the great Solemnity of the Immaculate Conception, which our Lady of Lourdes revealed to my own dear Saint Bernadette, but it is also the start of the Year of Mercy. I renewed my vows to Jesus through Mary, will work to break some attachments, and I hope to submerse myself even deeper into the spiritual life. "Wear the Veil” Day began a few years ago when two women from Charlotte, North Carolina started an apostolate called “Our Lady of the Veil.” Their purpose was to encourage women to take up the veil once again and promote the true Christian virtues of obedience, humility, and modesty. Andrea Hines and Tina Witt, the founders of “Wear the Veil” Day, thought that the solemnity of the Immaculate Conception would be a great time for women who had been considering it to start wearing a veil. I pray that all who participated in "Wear a Veil to Mass" Day for the first time will be inspired to continue their devotion to the Real Presence of Christ in the Eucharist by wearing the veil!